Steve Richards examines the current state of Jeremy Corbyn’s leadership of the Labour party, covering the events of the past year and exploring what the future holds. In The Corbyn Story heard on Radio 4 in 2016, Steve Richards tracked Jeremy Corbyn’s progress from his election as Labour party leader the previous year. Now Richards – a regular presenter of Radio 4’s The Week in Westminster who for many years was the chief political commentator of The Independent – turns his attention to Corbyn in the 12 months since he confounded expectations in the 2017 general election when Labour made a net gain of 30 seats. But how have Brexit and the issue of anti-Semitism affected Corbyn’s chances of running the country? Now, is this going to be an objective treatment of Corbyn and the Labour party? Or is just going to be another hatchet smear piece. Considering the way the Beeb’s news teams are stuffed with Tories, and its appalling bias against the Labour party, my guess is going to be the latter. But I hope I’m wrong. In addition to the DUP’s links to Loyalist paramilitaries in Ulster, it seems the Tory press over this side of the Irish Sea have been trying to scare people with the spectre of Sinn Fein MPs taking their seats in the British parliament in Westminster. The Scum, Express and the Scotsman have been running stories about this. This was too much for the French Philosophical Feline, who has produced a whole post showing how this very definitely won’t happen. He points out that Sinn Fein haven’t taken their seats in the British parliament ever since they became the third largest British party under Eamonn De Valera in the Coupon Election of 1918. If I remember correctly from when we did the ‘Irish Question’ as part of 19th century history at school, the Irish Nationalists’ policy of refusing to take their seats in Westminster goes back that far. The Cat quotes a long section from an article by Sinn Fein’s Danny Morrison, stating the reasons the party won’t ever take up their seats in the British parliament. It’s partly because they’re Republicans, and so won’t swear an oath to the monarchy. It’s also partly because they can’t see themselves, as a minority party in parliament, ever passing any useful legislation. But it’s mostly because they don’t recognise the validity of British government in Northern Ireland. They see Britain as a foreign, occupying power and so refuse to collaborate with it. Morrison also makes the point that it would be hypocritical of them to deny the authority of the British government over Northern Ireland, while actively claiming to have a right to interfere in British politics. The British press has a terrible reputation for propagandizing and stirring up trouble, and anything it says with regards to Ireland and Irish sovereignty should be taken with a ton of salt – especially if its in The S*n, a paper that lied about Hillsborough and hacked people’s phones. Mike over at Vox Political has produced another excellent blog post utterly demolishing the lies of the Tory warmongers that Jeremy Corbyn supported IRA terrorism, and that his election would somehow leave Britain more vulnerable to atrocities such as the one on Monday night in Manchester. His piece contains a graphic by Eoin Clarke showing that far from supporting terrorism, Corbyn consistently condemned paramilitary violence and sincerely looked and worked for peace in Northern Ireland. As such, he was respected not only by the Republicans but also by Loyalists. * In November 1994 Corbyn signed a parliamentary early day motion condemning the Birmingham Pub Bombings committed by the Provisional IRA. * The same year, Corbyn held several meetings with four Loyalist leaders to discuss the release of Neil Latimer, a member of the UDR, and to be informed that October at the Labour Party’s conference of the ceasefire the following week. * In October 2015 Ian Paisley’s wife told the Belfast Telegraph that she found the Labour leader courteous and polite, and thought he was a ‘gentleman’. * In February 1987 the Times apologised to Jeremy Corbyn. Murdoch’s British ‘paper of record’ had smeared him by claiming that he had not phoned the police to warn them of a suspected Provisional IRA terrorist in London. In fact Corbyn had. * In August 1988 the Irish Times hailed him as ‘a tireless campaigner for the Irish.’ Corbyn had worked to the quash the wrongful convictions of the Guildford Four, and reopen the inquiry into Bloody Sunday. * Corbyn in fact only ever met Sinn Fein leader Gerry Adams after Adams had been elected to parliament, 14 years after the commencement of the Troubles, in Adams’ capacity as an elected MP. He did, however, oppose Thatcher’s ban on broadcasting the voices of elected Sinn Fein politicians, and was keen that Adams’ constituents in West Belfast should not be silenced. * When Adams visited Westminster in 1996, Corbyn was only one of a number of Labour MPs, who met him. The meetings were solely concerned with reviving the IRA ceasefire. This was achieved several months later. And Bill Clinton, who was then president of the US, had the previous year invited Adams to the Whitehouse. As Clarke’s graphic points out, this places Corbyn’s meeting with Adams firmly within the context of wider attempts by politicians to secure peace in Ulster. Clarke does admit that there are two incidents, which are controversial, and do require an explanation. * Shortly after the Brighton bombing of the Tory conference, Corbyn and other MPs met Republicans in Westminster. Corbyn’s motive for doing so was to end the strip searching of female prisoners on remand. However, Clarke states that the meeting was insensitive and wrong. * In May 1987 Corbyn stood for a minutes’ silence to show respect for eight people, who had been killed by the British armed forces in Northern Ireland at a meeting of Irish sympathisers in London. Although one was entirely innocent, seven were members of the Provisional IRA. The circumstances of their deaths were unclear, and they may have been the victims of a ‘shoot to kill’ policy. The European Court ordered the payment of £10,000 each to the eight victims’ families. * As for Adams himself, Clarke states that it was the Tory government, who began talking to him eleven years before Corbyn became an MP. Adams had been released in prison for the secret talks the Conservatives were holding with Irish paramilitaries following the deaths of 476 people in 1972, the worse year of the Troubles. This was revealed in MI5 files released under the 30 year rule. The files also showed that the Tories considered that Adams genuinely wanted a ceasefire and an end to the violence, and that his answers to questions were ‘reasonable and moderate’. So while Corbyn did meet with Gerry Adams and other Irish Nationalists, he also worked with Ulster Loyalists. It certainly appears from this that Corbyn wanted to find a fair, peaceful solution to the violence and hatred in Northern Ireland. Mike’s piece also includes a short video, running just under a two minutes, by the Labour MP Chris Williams. Williams points out that 14 years ago in 2003, Corbyn had warned that ‘the Iraq war will set off a spiral of conflict that will fuel the wars, terrorism and misery of future generations.’ He also warned several times that police cuts would leave the country more vulnerable to terrorism. He also warned that intervention in Libya would lead to it becoming a breeding ground for terrorism. He also objected to selling arms to Saudi Arabia for the same reason. Williams states that Labour has a crystal-clear policy to make Britain safer, unlike the Tories. They intend to undo the cuts to the police force, and have the longer term goal of rethinking this country’s foreign policy. This means not sending more of our courageous young men and women to die in wars no-one invited us to take part in, and destabilising countries like Iraq, Afghanistan and Syria. And Williams asks his viewers to challenges the Tories, the rich, the media magnates and the cheerleaders for these wars in voting for Labour. New approaches and responses are required following the evil terrorist atrocity in Manchester, and Labour has precisely done that. Mike also includes a wonderful little video of Channel 4’s Krishnan Guru-Murthy refuting Michael Fallon, the Tory defence minister. Guru-Murthy quotes Boris Johnson at him. Boris had said that the Iraq invasion didn’t create the problem of Islamist terrorism – the attack on the Twin Towers occurred before that – but it did sharpen their resentment. Fallon then attacks the quote, believing it was said by Jeremy Corbyn. When Guru-Murthy points out it’s by Johnson, he then flails around trying to claim that it shows that Johnson really concurs with him, that this does not explain terrorism. But the Channel 4 newsman goes on, and quotes Boris as saying that you can’t disagree with the nay-sayers, who say that the invasion has increased Islamic resentment. Even after he’s been told, Fallon continues to state that he’d have to see what Boris Johnson really says for himself, and denies that Britain’s foreign policy explains away terrorism. Mike comments drily if there’s anyone, who doesn’t agree with Jeremy Corbyn? (Apart, obviously, from Michael Fallon). And at the very top of the piece is a quote from the former director of MI5, Theresa Manningham-Buller, that the Iraq invasion ‘undoubtedly increased the terrorist threat in Britain’. So Jeremy Corbyn was right about the Iraq invasion. He’s been right about the overthrow of Colonel Qaddafi in Libya, and he was right about the cuts to the police force. And he is very right to demand a ban on arms sales to the Saudis. And while two of his actions in support of the Republicans in Northern Ireland have been insensitive, he is not a supporter of terrorism, as the Scum, Heil and Torygraph would have us all believe. Go to Mike’s blog and read and watch the full article. Eoin Clarke’s information about Corbyn is in the form of a graphic, so that you can post it elsewhere on line to refute the Tories and their stooges, who still continue with their smears about the Labour leader. And if you really want to see a just end to the violence in the Middle East, and a sensible policy to eradicate Islamist terror in this country, then vote Labour on June 8th. If we don’t, if we continue to follow the Thatcherite warmongering of Blair, Cameron and May, it will only lead to worse violence and terror in the Middle East and at home. Mike rightly points out that Private Eye has an occasional column about this, ‘Revolving Doors’. It’s a fine old Tory tradition, though one which Bliar and New Labour also took up with enthusiasm. Before Blair took power, however, it was a real scandal under John Major. Then there was a series of scandals of cabinet ministers and senior civil servants taking up jobs in the very industries that they had helped to privatise. This was attacked in the British press as ‘sleaze’. On the other side of the Channel, the French have very strict rules against such conduct. There are laws against it. I think one of them, which has been proposed by the Eye, is that there should be a two year wait before a cabinet minister or senior civil servant can take up such a post. The reason businesses take on former ministers and mandarins is to get hold of their address book of useful contacts. While this has gone on in just about all area of politics and the economy, some of the most blatant examples have been with former defence ministers getting jobs with arms companies. A two year wait for such posts would vastly cut down on this, as by that time their diaries and lists of friends and associates would be well out of date. There’d be absolutely no reason for firms to hire them. This, however, is too much like good sense and genuine, disinterested government, for the politicos and apparatchiks at Westminster and Whitehall, and so it stands absolutely no chance of being introduced over here. I suspect if someone were to suggest it, they would be taken aside by the latest incarnation of Sir Humphrey Appleby, and quietly told that what they were doing was ‘courageous’. Or they’d try some other way to circumvent and undermine it. The French, meanwhile, were spectacularly unimpressed with what they saw as our failure to take the matters as seriously as it should. One French minister interviewed by the Financial Times stated quite clearly that simply calling it ‘sleaze’ misrepresented its true importance. ‘What you call ‘sleaze’, he said, ‘we call corruption’. So let’s call it like they do in la Belle France: Five Tory ministers have corruptly taken up jobs in the industries they supervised while in government. 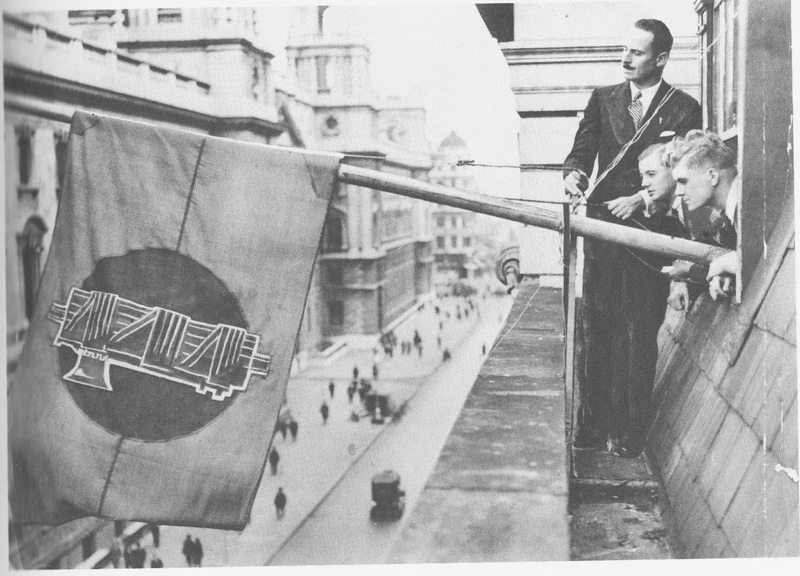 British Fascist Leader Oswald Mosley unfurls the Fascist Flag in Westminster, 1932. This is another video from The Young Turks. They’ve done a number of reports on violence at Trump rallies, where the crowd or stewards have beaten up protestors. In this piece, they discuss an incident where a ‘celebrity boxer’, Todd ‘the Punisher’ Poulton, slammed into and knocked to the ground a protester. The man had dared to call Trump a ‘Fascist’. This is exactly like Oswald Mosley’s rallies in Britain in the 1930s and then just after World War II. Mosley was the leader of the British Fascist party, the British Union of Fascists (BUF). Or to give it its full name, the British Union of Fascists and National Socialists. Their rallies and marches were notorious for the violence meted out to their opponents. The Fascist stewards, the ‘Biff Boys’, were trained by a boxer, Ted Lewis. Lewis was Jewish, and for a long time this led many historians to believe that Mosley was a late convert to anti-Semitism. In fact, recent studies of Mosley, like Steven Dorrell’s Blackshirt, show that he was an anti-Semite from the start. After the War, Mosley tried to make a comeback, ditching the Fascist uniform in favour of ordinary suits. In his manifesto, Mosley: Right or Wrong? he argues for an apartheid Britain, from which Blacks and the majority of Jews have been expelled. Those that remain are kept rigidly separate from the gentile, White British. Mosley attempted to justify this policy on both racial and cultural grounds. Jewish culture, he argued, was incompatible with ‘British’ values. Trump is almost exactly like Mosley. Both are extremely rich, though Mosley was an aristo and Trump an American businessman. Both want the expulsion or exclusion of particular ethnic minorities from their countries, and the remainder segregated from the general population. It’s as if the immense changes and improvements in racial attitudes over the last 80 years simply haven’t happened. It’s astonishing to see something like Donald Trump holding mass rallies in this, the second decade of the 21st century, just like Mosley and his squadristi eight decades before. Surely 45 million were not killed in a terrible global war against Fascism, just for it to come back now?